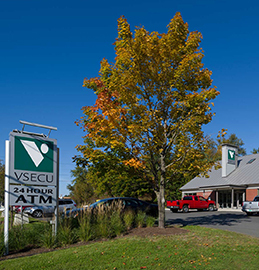 MONTPELIER, VT—VSECU today announced that its most recently constructed branches, located in Waterbury and St. Johnsbury, have earned ENERGY STAR certification. The EPA award signifies that VSECU facilities perform in the top 25 percent of similar facilities nationwide. Overall, ENERGY STAR buildings use 35 percent less energy and generate 35 percent fewer greenhouse gas emissions than other facilities. Applicants for ENERGY STAR certification are scored on a scale of 0-100 percent and must achieve 75 percent or higher to earn certification. VSECU’s Waterbury facility was rated at 86 percent and the St. Johnsbury facility came in at 87 percent. The credit union’s Rutland facility earned LEED – Gold certification in 2012 and ENERGY STAR certification in 2013 and is currently seeking its 2015 re-certification.